Iowa Pork Producers Association asked me to attend the Iowa Bloggers #IATourDePork and paid for dinner and accommodations in Des Moines, in addition to giving me a beautiful gift basket with pork-inspired products. This post is a recap of my time on the #IATourDePork and contains my personal opinions, of course. I like to be…close to my food. You know? I like to know how the meats I eat were raised; how they were treated, where they live, and what they ate. I like to get to know the farmer who raised that livestock and see the care that he or she put into that animal's life. I prefer to know these things and willingly shell out a bit more money to ensure the food I eat was raised humanely and sustainably. Fruits, veggies, meats, dairy products - everything. The Iowa Pork Producers Association (IPPA) is working hard to get the word out about the commercial pork industry, so consumers feel knowledgable about the pork they are feeding their families. And really, guys, it comes down to knowing where your food comes from! If you buy from a farmer, PERFECT. You are cutting out the middle man and going right to the source. You can purchase pork from a commercial pork producer, but the first step is approaching him or her with your request. If you purchase your pork from the grocery store, GREAT. Do a little research online or ask the employees at the meat counter where they source their meats. They should know and should tell you, because they are experts at their craft. If you dine out, do a little investigating on where they source their meats so you can feel confident with your meal. 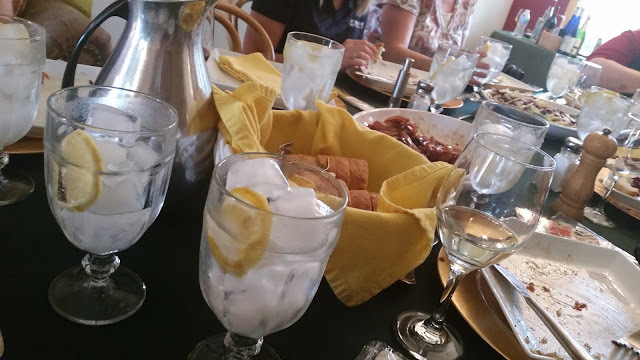 For example, my Iowa blogger friends and I had a special dinner at Splash, prepared just for us by Chef Dominic, who owns Splash and Jethros. 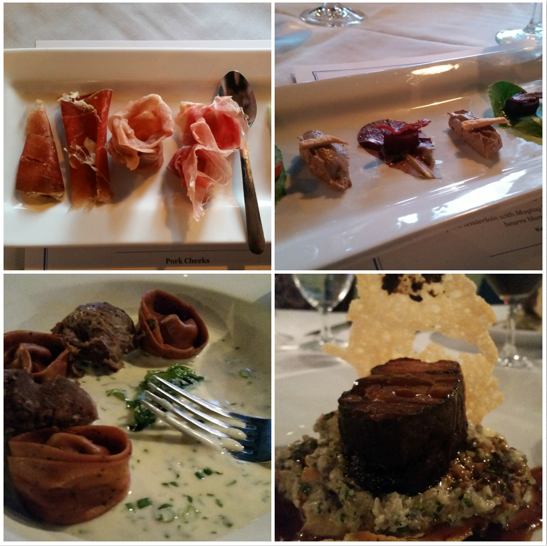 We dined on hams aged for 400 days, pork liver pate, pork cheek, and deconstructed pork shoulder. All of these dishes were prepared from Iowa hogs and were selected because of how they were raised. THAT is a meal I can stand behind. Plus, it was a delicious experience. And they gave us cake. I am so glad Cristen from Food and Swine arranged this dinner for us! 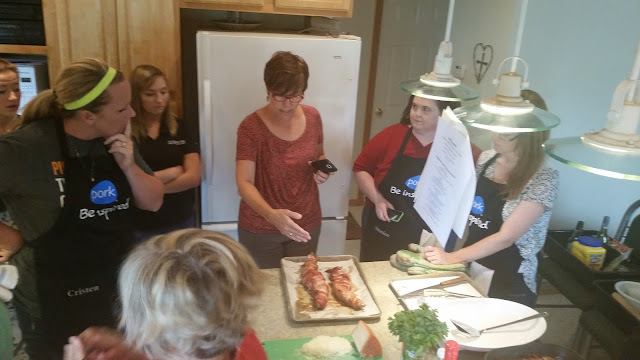 The next day my blogger friends and I went to Chef Terrie's home and the hub of Country Club Market for a hands-on cooking demonstration featuring pork that all consumers can access at their local grocery stores. 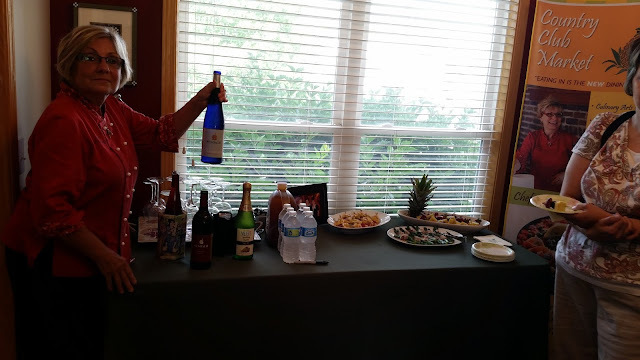 Chef Terrie had delicious appetizers and local wines for us while we cooked. I partnered up with Kristen from Make the Best of Everything, and we made a cabbage salad with a bacon vinaigrette, topped with Maytag blue cheese. We also learned about food styling from Susan of Main Dish Media. Let me tell you, this industry is crazy competitive and such a creative art. After absorbing all Susan had to offer about food styling, we all sat down to lunch in Chef Terrie's dining room. Our meal included a bacon-wrapped pork tenderloin, a mushroom, asparagus and bacon risotto, a cabbage salad, fresh baked bread, and bananas flambé for dessert. We came away with a new appreciation for the Iowa pork industry, as well as insights on sourcing pork to feed our families, whether it be from the farmer or from the grocery store. 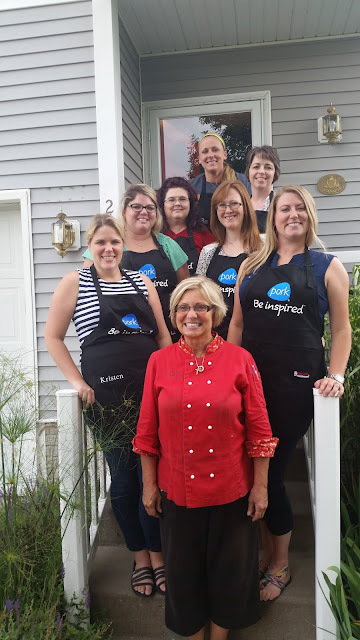 Please check out my friends who I spent two days laughing and learning with: Kristen from Make the Best of Everything, Alicia from Fit and Farm, Jenni from The Gingered Wisk, Monica from Rockin the Kitchen, Jenny from In the Kitchen with Jenny, and Cristen from Food and Swine. Great post our pork industry suffered for a while against imports from the rest of Europe, but people here also have a new appreciation of locally raised foods as you say whether it be pork, other meats, fruits vegetables and dairy. People power has meant a resurgence in our small farm producers which is good for everyone!